The move, announced by the Education Department this week, could impact hundreds of cases involving children with special needs whose families believe their schools aren't providing adequate accommodations. The decision is a temporary victory for a coalition of civil rights groups - the NAACP, the National Federation of the Blind and the Council for Parent Advocates and Attorneys - that sued the government this summer. They claimed the Education Department was tossing aside legitimate civil rights grievances in the interest of government efficiency and clearing a backlog. That lawsuit, filed in the U.S. District Court in Maryland, is ongoing as the civil rights groups seek to make the approach announced this week permanent and binding. The Education Department's reversal "shows that recent legal action taken against them is working," said Denise Marshall, executive director for the Council of Parent Attorneys and Advocates. The Education Department's Assistant Secretary for Civil Rights Kenneth L. Marcus said ensuring equal access to education remains a "top priority" for the department. Marcus - who took over the Office of Civil Rights, or OCR, in June - said in the statement that he decided to alter the investigative protocols after receiving "important and constructive feedback" on it. "While we continue to work to improve the timeliness of OCR case processing, we have determined that additional revisions will help improve our work and allow us to be more responsive to students, stakeholders, and our staff," he said. 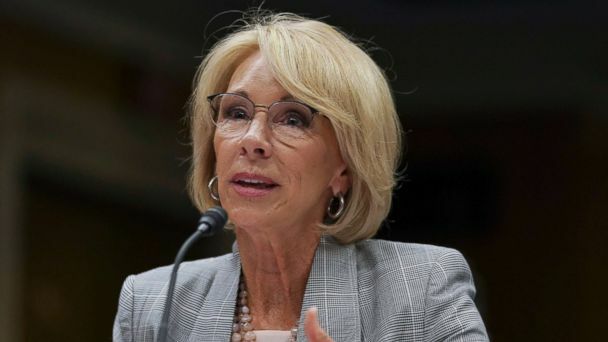 At issue is a decision last March in which the Education Department said it would dismiss civil rights grievances that were part of a "pattern of complaints" that placed an "undue burden" on the government. The Education Department also at the time eliminated the appeals process. The changes were included in a case processing manual used by federal officials who investigate civil rights complaints at schools. Marcie Lipsitt, a Michigan advocate for special education students, said the move was aimed at people like her. Lipsitt said she filed some 2,400 complaints in two years claiming that certain school websites, including online math programs, weren't accessible for the blind or visually impaired. Lipsitt said she had already resolved more than 1,000 of those complaints with school districts. But after the Education Department changed its investigative protocols last March, she received a flood of notifications that hundreds of her complaints would be dismissed. She said she was infuriated "that they could basically destroy all the work I've done in just a couple weeks." Eve Hill, a lawyer representing the civil rights groups, said she believes the Education Department's decision to backtrack was intended to invalidate the lawsuit. Shortly before the announcement, Hill, who works for the Baltimore-based firm Brown, Goldstein and Levy, said she had asked the judge in the case to lift a temporary stay and move ahead with litigation. Hill said the lawsuit isn't over because the recent change amounts to a non-binding "promise" that could be reversed at any point. She said she wants a settlement agreement or a ruling from the federal judge that would permanently block the government from dismissing serial filings. "There's no reason to do that," Hill said. "People face discrimination more than once. It's the Education Department's job to investigate them." Also unclear is what will happen to the 692 cases filed by five people - including Lipsitt and her son - that were dismissed after the new approach took effect in March. An Education Department spokesman said the office plans to "look at the issues raised in the previously dismissed cases." The NAACP said it will back its legal team in demanding that the government agree to investigate those 692 cases and make this new policy permanent. "The right to an equal education is fundamental to the principles of this country, and denying students the right to enforce their civil rights denies them the foundation they need to succeed and contribute to their communities," said NAACP President Derrick Johnson.